Campbell Hausfeld Air compressors - Bond with the best! Campbell Hausfeld holds a prestigious legacy of manufacturing quality products for more than 165 years for both do-it-yourselfers and the professionals. They are indeed the market leaders in home improvement and automotive industry. Their unmatched air compressors have consistently been the best recommended, sold out and earmarked products of invention. Their commitment is commendable and their customer-centric policies laudable!! Air compressor packages air sufficiently to create an increased air pressure which is applied differently from home needs to industrial purposes. The Campbell Hausfeld Air Compressors are outstanding for home repair needs in their quick working convenience and least expensive tools. They have the extreme duty line which is the best for heavy-duty top-of -the line engineering jobs. They run an incredible variety of power tools from the sandblaster to the die grinder. They are found to be easy to move, expand (Inflates 5 times faster) and most economical with longer life. They deliver more torque and power (higher revolutions). They have accurate information on their output power which helps in matching an air tool or application. The standard duty line of products lasts 1000 hours of use whereas the Extreme duty line (used at industrial sites) offers 2000-3000hours, some of the higher end models offer 15000 hrs! All the extreme-duty contractor air compressor models are fitted with regulators, needle and ball bearings and motors with automatic overload protection. These air compressors have a wide range of models for commercial and contractor purposes. We shall now discuss some of their models based on their use: For Inflation of car tires, sports balls, swimming pools, cleaning workbenches, blowing off tools, brad nailing, stapling and air brushing one can choose the model. FP2048 which is a 2-Gallon Hot dog compressor with its 8 piece accessory kit is a solid body with good gauges and hence is highly recommended product in this series. Campbell Hausfeld air compressors have exclusive models for fastening works (Finish nailer jobs), For example: model WL6111 26 Gallon ASME vertical compressor model with 150max PSI, 5HP, 6.9 CFM@40 PSI. It's used for repair and replacing roofing shingles. Among the Single stage models the model CE4000 f with a tank size of 60 Gallons and a warranty of 3 yrs, this finds greater recommendation for consumer usage. Among the 2-Stage Air compressor pump in Campbell Hausfeld Air Compressors which are used for heavy-duty commercial use, the 5 HP TF2101 is useful. This is a flywheel model which has two grooves for B-section belts. The model VT6290 model with its 20 gallon horizontal ASME tank pressurized by twin cylinder is powerful extreme duty residential model and runs pneumatic tools like wrenches, sanders, paint guns, nailers and staplers. 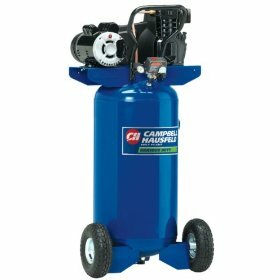 The commercial air compressor model includes the TF2112 series which is a 2 stage 7.5HP with an 80 Gallon vertical ASME tank which produces 27.2 SCFM at 90PSI. This model delivers 15,000 hours of reliable performance. Though the model has complaints of noise, one could tune to them for their quality! Return From Campbell Hausfeld Air Compressors Page to Home - Finishcarpentryhelp.com.